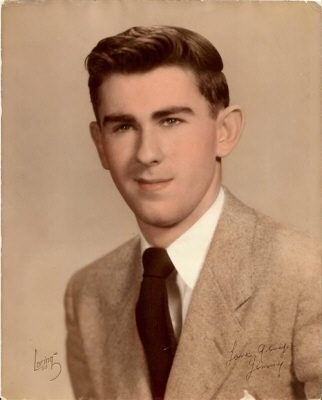 Beverly - James R. Rice, 86, beloved husband of the late Nancy (Cavanaugh) Rice with whom he shared over fifty years of marriage, died Sunday, November 11, 2018 at the Beverly Hospital. Born in Gloucester, he was the son of the late Charles and Julia (Joy) Rice. He graduated from Gloucester High School and earned his bachelor’s degree in business administration from Norwich University. An honorably discharged veteran, he served his country as a member of the United States Marine Corp. He continued to his service as an active member of the Marine Air Reserve obtaining the rank of Major. Mr. Rice owned and operated Reps North East Inc. for many years until the time of his retirement. Following his retirement he worked in sales for Scott Oil. A longtime resident of Beverly and an avid golfer, he was a member of the Wenham Country Club. He was a loving father, grandfather, great grandfather and friend who will be missed by all who knew him. He is survived by a son, James “Jay” Rice and his wife, Mary of New Hampshire, two daughters, Julie Poor and Sheila Rice both of Beverly, four grandchildren, Jimmy Rice and his husband, Luis, Mark Rice, Rachel Matthews and Cody Poor, two great grandchildren, Beatrix Matthews and Addison Matthews and several nieces and nephews. He was also the brother of the late Shirley, Barbara and Charlie Rice. His funeral Mass will be celebrated at St. Margaret’s Church, 672 Hale Street, Beverly Farms, Tuesday, November 20, 2018 at 10:30 a.m. Relatives and friends are invited to attend. Visiting hours at the Campbell Funeral Home, 525 Cabot Street, Beverly, Monday from 5 to 7 p.m. Burial in Beverly Farms Cemetery. Contributions may be made in his memory to the charity of one’s choice. Information, directions, condolences at www.campbellfuneral.com. To send flowers or a remembrance gift to the family of James Robert Rice, please visit our Tribute Store. "Email Address" would like to share the life celebration of James Robert Rice. Click on the "link" to go to share a favorite memory or leave a condolence message for the family.